Price: Rs. 155 on Amazon. After 'Mrs. 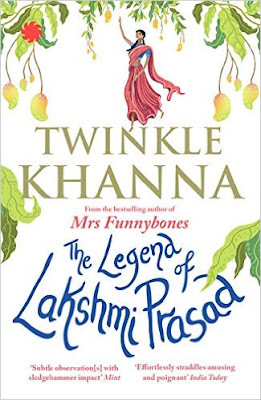 Funnybones', I was waiting for the next book from Twinkle Khanna. Ever since she made the best decision of her life by quitting acting and turning columnist, I've been a fan of hers. I like people who say things the way it is without trying to beautify it or reduce the tone of it. Couple this with sarcasm and dry wit, you have a winner! Twinkle Khanna is one such columnist for me. Her sense of humor comes out in the best way possible giving the right importance to current affairs/issues. Her style of writing is also different from the rest and makes reading a breeze. Unlike Shobhaa De who only writes heavy words to mock people and tradition, Twinkle Khanna hits the right note. While her first book was an A to Z of her columns, her second book marks her foray into fiction. No matter what it was, I trusted her so much that I would even buy her book if it was an ode to her short tryst in Bollywood. Coming to think of it, wouldn't that be a nice concept for her next book? The Legend Of Lakshmi Prasad is a collection of four short stories with women and their basic needs playing a pivotal role in each story. I'm not a fan of short stories. The very reason why I'm not the one to pick up anthologies and anything with a collection of stories. Don't get me wrong, I even hated the collection of short stories by Jeffery Archer while I'm a huge fan of his novels. Short stories do not make an impact on me. I think it is a hurried take on what one has to say. To put it simply, short stories are, well, short. I'm the one who like a strong story from start to finish. I like to live the life of the protagonists and grow with them. Short stories do not leave room for that. This book has four stories and I'll go one by one. The first story The Legend Of Lakshmi Prasad, is about Lakshmi who single handedly transforms her village and the women folk in it. It deals with the most common issue in our country that is considered almost grave; the birth of a girl child. When Lakshmi's sister comes back home from her marital home, Lakshmi realizes the pain the parents of a girl child have to go through. She sets to solve all their problems and does so successfully. While the story is predictable and cliched, it does leave you with a smile at the end. This story reminded me of the Amar Chitra Katha stories that we used to read as children. The perfect Indian village setup, a rebellious girl and a cause to fight for. We all have seen and read this before, but you can call this as old wine in a new bottle. Salaam, Noni Appa was my most favorite story in the book. When a 68 year old widow Noni Appa falls in love with her married yoga teacher, she refuses to accept it first thinking about the usual "log kya kahenge?". When tragedy strikes and she sees the love Anandji has for her, she slowly warms up to the feeling of love. Binni her sister, also a widow, stays with her and forms the perfect third angle to the story. From her trysts to the beauty parlor, to her laziness, everything is adorable. This story would not fail to warm the cockles of your heart. There is something so endearing in the silence that surrounds Noni Appa and Anandji. Subtle and pure, this is fresh love in their twilight years that continues to shine bright. If The Weather Permits was my least favorite story of the four. This is about Elisa Thomas and her five weddings. Every time, she gets married for her parents and is back home before her parents have settled the expenses of her wedding. The men she marries are weird. While one wants to kill himself, another wants to kill her and then kill himself. Weirdos are not hard to find, but sadly for Elisa she seems to be a weirdo magnet. While the author manages to describe a malayalee household in a decent manner, including the 'meen moilee', the story doesn't lead anywhere. There is no right start, middle or end to this. It reminded me of Vishal Bharadwaj's 'Saath Khoon Maaf', thanks to the crazy husbands that Elisa and Priyanka Chopra's Susanna seemed to find. While I liked the movie for the concept and brilliant acting, this story could be easily forgotten. The Sanitary Man From A Sacred Land is the story of Arunachalam Muruganantham or the man who is famously known in India as the man who wore a sanitary pad. The author has tried to fictionalize his story and gives us Bablu Kewat who wants to make the life of his wife and other women easier. When he purchases a pack of sanitary pads for his wife, he is shocked at the amount he has to shell out for it. He then sets out to build a machine that churns out sanitary pads at less than half the cost of what is available in the market. His wife, mother and sister do not understand his obsession with sanitary pads and soon move away from him. Bablu remains undeterred and sets out to build the machine and implement it many villages. He soon garners fame and nearly falls in love with his English teacher only to soon remember that he has a wife who now wants to return to him. This is a brave story and something that deserves to be told. Arunachalam Muruganantham comes alive in the form of Bablu Kewat who fights all odds to succeed in his mission to give women a healthy and clean life. Men like him deserve to be applauded. I finished this book in a couple of hours just like her first book. But sadly, this hardly matches up to the expectations that her first book built. I missed the columnist whose sarcasm was spot on. Here the author tries to enhance descriptions of the scenes with the help of superfluous adjectives and some never ending sentences. The scene setting of a mallu household in the third story seems contrived and so cliched. The ease in her columns were absent in the book and apart from a beautiful thought, the stories fail to deliver anything else. I'd probably go back to reading Mrs. Funnybones again after this and would continue to look forward to her columns instead of expecting more fiction from her. Verdict: A good attempt at fiction. Since it doesn't take a long time to finish this book, it can be worth a read. Your review confirms what I read in the others. But you have given her a fab idea - she really should do a tongue-in-cheek book on her Bollywood experience. Haven't read too many good reviews of this book. Wondering whether l should read it. Like you, l am not a fan of short stories either. Then you probably should stay away from this one Rachna. Oh yes, Soumya. That would be so perfect. A satirical account of her time in Bollywood, narrated in her trademark style. As far as this book goes - I was curious about it after Mrs Funnybones, but it seemed to be getting very lukewarm responses/reviews, so had put it off. I might eventually pick this up, because I am always curious about the authors I enjoy. I hope so writes something like that next. Do pick up the first one. Oh yeah this would be best for a flight read.